Stroke is a major cause of disability and death due to a high incidence rate, the severe and heterogeneous nature of the insult, poor recovery, and a paucity of treatments. The only currently clinically approved treatment is recombinant tissue plasminogen activator to restore cerebral blood flow, but eligibility requirements restrict this treatment to approximately 5 % of patients. Unfortunately, therapeutics designed to provide direct neuroprotection, by blocking the neurotoxic ischemic signaling cascade, as identified in numerous preclinical studies, failed in clinical trials. This failure in translation from experimental models to clinical trials suggests that defining criteria required for neuroprotection may have been too narrow in focus. Given the ineffectiveness of monotherapeutic strategies which target one cell type (neurons) and usually one signaling target, neuroprotection may only be achieved via therapeutics which are combinatorial in nature, targeting multiple cell types – the neurovascular unit – as well as multiple time-dependent neurotoxic mechanisms. Such a comprehensive approach sets more stringent standards but should ultimately yield the “best-in-class” therapeutic required to provide clinically relevant neuroprotection. Preconditioning of the brain is a strong candidate to satisfy these more stringent criteria required to produce a “best-in-class” therapeutic. Preconditioning elicits complex endogenous responses in the neurovascular unit that act by pleiotropic mechanisms to block death pathways, promote survival pathways, and increase resistance. However, potential clinical implementation of preconditioning via chemicals faces challenges, such as potential toxicity, efficacy, and penetration through the blood-brain barrier; its major limitation is the requirement for administration before a stroke, which places a ceiling on the degree to which preconditioning in the clinic may ever be achieved. To address these issues, we introduce a novel concept in preconditioning to combat stroke, which we term nutraceutical preconditioning, which is preconditioning achieved through supplementation of an essential item in diet. Natural/endogenous compounds such as the omega-3 polyunsaturated fatty acid, alpha-linolenic acid (ALA), represent very promising candidates in this novel concept of achieving preconditioning-driven neuroprotection via dietary supplementation of this nutraceutical. Conventionally, dietary supplementation has been considered as a means to reduce risk factors and the frequency of stroke, but not stroke severity. 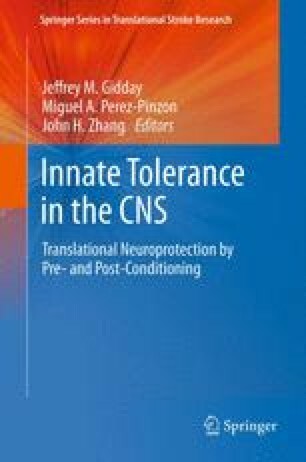 The pleiotric ability of ALA to trigger responses that are multicellular, mechanistically diverse, and with a wide temporal range mirrors those responses typically elicited by preconditioning, resulting in neuronal protection, stimulation of neuroplasticity, and brain artery vasodilation. In addition, ALA supplementation by modification of the daily diet prevented middle cerebral artery occlusion-induced mortality and cerebral damage. This result suggests that dietary supplementation also alleviates postischemic damage, extending its actions beyond simply reducing stroke frequency. Inducing brain preconditioning through ingestion of omega-3 prophylactically in diet may circumvent the requirement for preemptive application and drug delivery to the brain. This novel concept of nutraceutical preconditioning through dietary supplementation may not be restricted to omega-3 PUFAs such as ALA but may in fact extend to other existing or novel nutraceuticals. Ultimately, the future of preconditioning may largely depend not only upon its successful translation to the clinical arena but also to daily life. The authors are grateful to G.L.N, ONIDOL, the “Fondation de la Recherche Médicale,” and CNRS for their support. Nicolas Blondeau is also grateful to Pr Michel Lazdunski and Dr Catherine Heurteaux for providing the opportunity and their continued support since 1997 to work on omega-3 PUFAs and brain protection. N. Blondeau also wishes to thank Pr Bernadette Delplanque for many helpful discussions. Finally, we thank all our past and present team members who have contributed to the data discussed in this chapter.